QiZhi is an Android application to check real time air quality data of all major cities in China. Air pollution has become a serious problem in China. Major cities like Shanghai, Beijing and Guangzhou have experienced increasing number of hazy days in recent years. More and more city residents across the country realized air pollution has become a serious threat to their health. We compared four popular air quality Android apps, which are Air Quality China, China Air Quality Index, Moji, and Moji Air Quality. We analyzed the data types and accuracy, interaction patterns, and UI design for each app. According to the pros and cons, we defined the initial features of QiZhi. 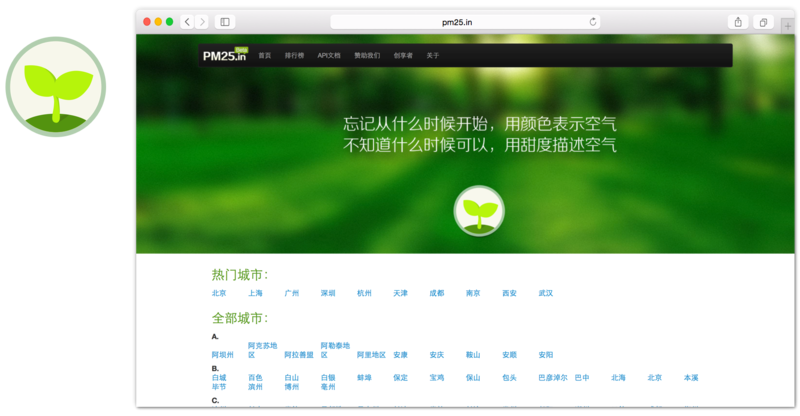 The data source of QiZhi is PM25.in, an website providing API for developers to access air quality data from 1512 monitoring stations for 372 Chinese cities. The air quality data consists of the value of PM2.5, PM10, CO, NO2, O3, and SO2. According to the current air situation, basic health advices are given: whether suitable for outdoor sports, whether need to wear masks.